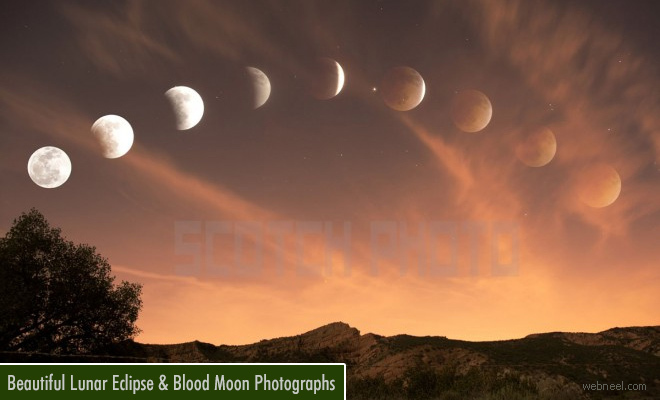 Lunar Eclipse Photography : When the moon passes directly behind the earth a lunar eclipse occurs. The Sun, earth and Moon should be in a single line and on a full moon day, a lunar eclipse will happen. It's really a beautiful sight to watch. Usually after a Lunar eclipse and solar eclipse will take place, with two weeks There are several myths for Lunar eclipses, Among the collected myths is a story about a jaguar that attacked and ate the moon. The big cat's assault explained the rusty or blood-red color that the moon often turned during a total lunar eclipse. During lunar eclipse, elders advise pregnant women not to venture out, shouldn't bathe till the eclipse has passed, shouldn't eat food during eclipse. We don't know the reason behind the consumption of food during eclipse, but it's definitely something to do with our ancestors and their stories. See how the Lunar eclipse evolves through the lunar eclipse photos. Get your cameras ready for the next lunar eclipse photography sight. Blood Moon - The Full Moon turns into a bright copper color during a total lunar eclipse. Our earth's atmosphere acts like a lens filter. It bends the red sunlight into our planet's shadow and scatters out blue light. There are so many myths surrounding the blood moon. Among the commonest superstitions connected with the blood moon are: that to see the thin crescent over the left shoulder is lucky; to see the moon straight before you signifies good luck to the end of the season; and any wish made at the first sight of the new moon will come true. Superstitious persons believe that the time of the new moon is propitious to planting, courtship, the starting of new business ventures or trips, cutting the hair or fingernails to effect better growth, and so on.